Players get new fixes a bit faster and can check out the new changes that will drop in the next patch. Developers get access to information about new bugs that may have slipped into the patch. This will reduce the number of hotfixes for future patches. We will make a formal announcement to the community when we are going to put the latest patch up for beta testing. We are starting this process with the 1.04 patch. These patches may be unstable. We will be doing work on the patches and they haven't gone through a full QA cycle so unexpected things can happen. To be safe, I would avoid using any saved games that you do not want to get corrupted. If you do want to use those saved games, it is at your own risk. These patches may stay the same over the entire testing period, but that is unlikely. There might be frequent build changes, so expect to have to download multiple builds over a testing period. More than likely you are going to find bugs in these patches and you will need a place to report them. You can report these bugs by going to our new forum for patch beta bugs and support. One thing I ask is that you only report bugs that are specific to the patch beta. If the bug happens in the currently patched base game you should report it in our regular tech support forum. For information on how to report bugs, please look at this post. Are the STEAM succes always "running" with it ? I am not sure what you mean? Are you asking if the patches will change frequently? As a user of 'beta' patches for Gal Civ III, once you Opt in to Beta pacthes you will always get them. This is a great idea, thanks! Excuse, my poor English i guess. I asked for STEAM Achievement ("succès" in French). Edited by BillyCorgan, 09 April 2015 - 01:38 PM. No worries. I just wanted to make sure that I answered your question properly. The achievements should be running in these builds. It is possible that we might introduce an exploit that would allow a player to cheat achievements, but it is unlikely at this point. Yup. 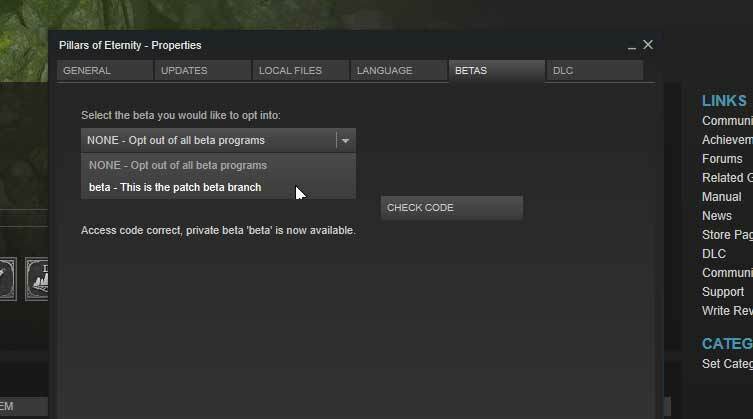 Once you do this process you can jump between the beta patches and your normal game no problem. We actually use this same process to distribute QA builds to people around the world (and in the office). This is pretty awesome. I loaded the beta just now; I'll be playing it later tonight to check things out. I'm hoping the save/load times will improve. Thanks for the opportunity! Nice to see, using steam features efficiently but on a side note: while Its cool to still get the support about bug, features, polish, etc... but please dont change the balance too much, because I feel that my extremely hard playthoughs (calculated to extreme stats chars) are going to waste once It gets out. Paradox games(EU4, CK2) offer patch rollback on Steam. Perhaps Obsidian could do the same? So when a person feel like ready to patch he/she can easly switch to It. Edited by ruzen, 09 April 2015 - 02:00 PM. Pretty cool. 7DtD uses the opt in and players can go back and play older versions of that alpha if they wish etc. It's a nice feature. As i like it there is one thing that need to be sad Like Freaking Really? Are there patch notes for beta 1.04? If not, how should people be looking for changes in the new patch? You can find a copy of the 1.04 patch notes here. 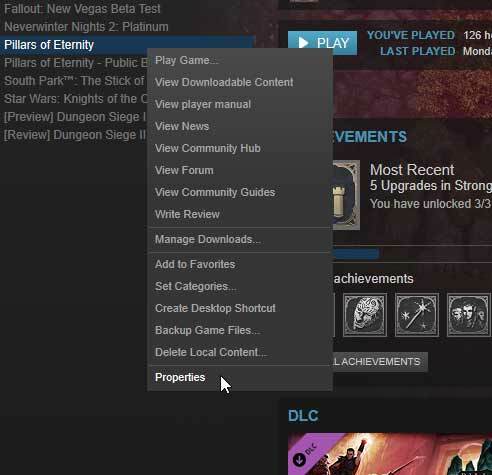 My steam now shows [beta], but when I launch the game, I see 1.03.0533 in the menu screen. Should this be 1.04 ? A sound practice. Happy to see Obsidian taking this route. Ravenous fans get the patches early. Obsidian gets some larger scale beta testing. More cautious or casual fans get more solid final patches. Where we can send any reports?) i mean when testing beta version.